From having zero tigers in 2009, Panna Tiger Reserve in Madhya Pradesh is now roaring with the success of its big cat reintroduction experiment. Aided by the commitment of the forest staff, this initiative not only caught international attention but has also restored the emerald forest’s erstwhile days of glory. Visiting Sariska Tiger Reserve as part of our Master’s field training at Wildlife Institute of India, my batch, on a late evening drive, possibly saw one of the last remaining tigers of the region. In the blink of an eye, the large cat crossed a dirt road that was lit up by the yellow headlamps of the minibus, offering a fleeting glimpse of its fiery coat broken by dark black stripes. This was in 2004. In 2005, Sariska was officially declared bereft of tigers. The notorious wildlife poacher Sansar Chand, who died recently, was allegedly single-handedly responsible for wiping out the entire tiger population of Sariska. Just as people were recovering from this rude shock, another debacle occurred when Panna Tiger Reserve too was declared bereft of tigers in 2009. Located in the Vindhya mountain range and spread across Panna and Chattarpur districts of Madhya Pradesh, Panna Tiger Reserve maintains much-needed continuity in an otherwise fragmented landscape. The Vindhya range has an elevation ranging from 450 to 1100 metres and forms the border between northern and peninsular India. These ranges are the source of important rivers including the Chambal, Betwa, Ken (Karnavati) and Tons, and they support a broad range of biodiversity thanks to their unique tabletop plateau topography. During a short two-hour drive in the evening, I saw several Sambar deer standing in a regal manner, several groups of Spotted deer, White-backed Vultures, Eurasian Griffons, Savanna Nightjar, Brown Fish Owl and large and majestic Blue bulls. This was a refreshing change from the depauperate Trans- Himalayas where I had been studying the globally endangered Snow leopard for the past six years. In the evening, as I returned back to the lodge, dusk had started enveloping the landscape and I stopped to listen to the call of a Savanna Nightjar in flight against the backdrop of the tranquil Karnavati. Fireflies in flight levitated gently adding to the magic of the landscape and I wondered if the term ‘dry-deciduous’ did justice to such a resplendent forest. The next day, I went to see the monitoring of tigers by the forest department personnel. Tigers are monitored 24/7 by several teams of dedicated staff. It took a lot to get tigers back to Panna; it takes, even more, to ensure that they survive and thrive. The team soon picked up signals from T4, and during my conversation with the forest personnel, I discovered that she was the orphaned daughter of a tigress from Kanha who died defending three cubs against a male tiger. The cubs were barely two months old then, and Joseph Vattakavan who was leading the WII research on tigers in Kanha had gently pulled the cubs out of their cave. 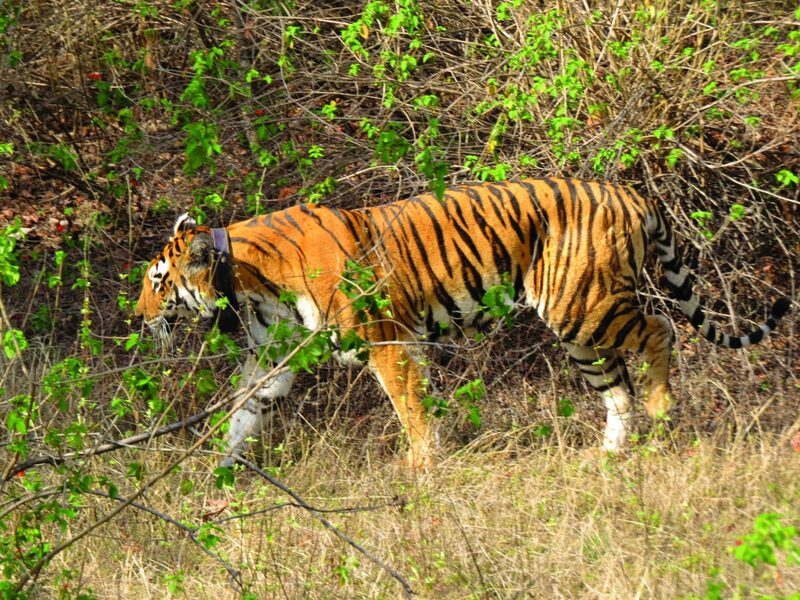 The radio-collared tigresses in Kanha were more than a study subject for us and the loss of that particular tigress that we fondly called Kaali was a setback. Despite knowing and understanding that a male tiger attempting to kill the cubs to gain access to the female was a natural process, we were saddened at this loss. A researcher is supposed to be detached from the study subject, ignoring such emotions in the pursuit of truth, but in the course of working with these intelligent animals and becoming almost a part of their everyday lives, it’s quite difficult to remain detached. Following the direction of the signal for about 300 metres, I came across a large Sambar stag, and about 100 metres to the left, on a hillock, was T4 resting underneath a bamboo thicket. She seemed well fed and was apparently guarding her territory against another female trying to expand her range. I looked at her in wonder; a beautiful full-grown tigress that had once been doomed to fate in a zoo was now hunting on her own and even raising a litter. The rendezvous in Panna would be incomplete without seeing the unique four-horned male Chousingha. I encountered one in his brownish coat, made even more glorious in the golden light of the evening sun. 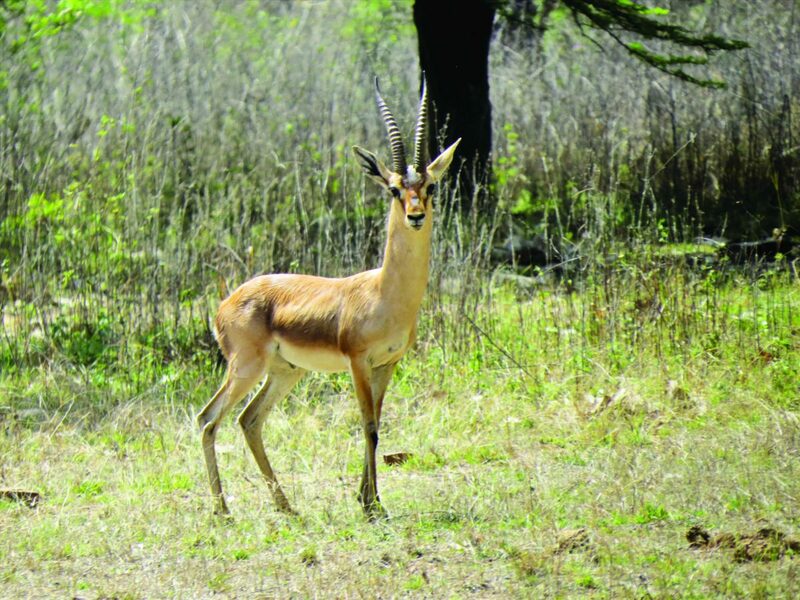 The Chinkara provided yet another visual treat, displaying its graceful stotting behaviour. Panna is a heaven for nature lovers. While tiger attracts the most tourists, Panna’s exquisite landscape and smaller fauna can also leave a visitor spellbound. As of now, the tiger population in Panna has reached 30 and T-5, a hand-reared tigress has given birth to a litter of two. The breeding females bode well for Panna. The entire staff of Panna Tiger Reserve has been at the forefront of protecting the tigers and their hard work often comes at huge personal costs, but no one seems to complain. Under an able leadership, Panna has turned the tables and the void left by the disappearance of the apex predators has been fulfilled again. One factor that worries the current management is the ratio of males to females. This is likely to take some time to reach a natural stability as the Tigers sort out their own territories and social system. But reintroductions are expensive, time-consuming and have poor success rates, which often make it difficult to justify spending precious conservation money on reintroductions as against other in situ conservation measures. Despite this, reintroductions remain an important tool in carnivore restoration efforts. The current success highlights what scientific knowledge and a determined management can achieve together. But at the same time, we should remember that reintroduction is the last tool, a desperate one, which seeks to correct the failures of the past. Conservationists should ensure that the desperate situation necessitating resort to this tool should never arise. While on a long walk to reach a potential vulture roosting site, the forest guards accompanying me stopped near an old structure—a hunting machaan of the maharajas of the past. I opened my eyes to the mesmerising vista ahead. The Karnavati River in front had become quieter and even more hypnotizing. Across stood the verdant green riparian vegetation and further up mixed trees of Sal, Arjun, Tendu and Mahua. Spring had set in and the multiple hues of greens and browns were a visual treat not to be forgotten. This was the same Panna that had lost its apex predator and has now come back to life again. The king has reclaimed his rightful place and was now indicating that we tread softly in his bountiful kingdom on our modern four-wheel drive jeeps. To all the people who have made it possible, I say, take a bow; may your personal sacrifices serve as an example and may your tribe that puts nature on the forefront grow in leaps and bounds. A wildlife biologist by profession, Rishi has studied tigers and snow leopards in diverse habitats in India. His research attempts to unravel how big cats use their habitats under a varied range of natural and manmade conditions. Currently, he works with WWFIndia and is associated with NCF as a PhD scholar.